Problem: Charming Charlie was a new and relatively unknown concept on the block that still needed to make a positive impression on prospective landlords. They wanted a “world class” website that would illustrate the zeal for the brand and the brilliance behind the concept. Solution: Develop videos, interactive concepts, and fresh content that would illustrate the brand and impress landlords as well as create engagement and excitement with loyal consumers. 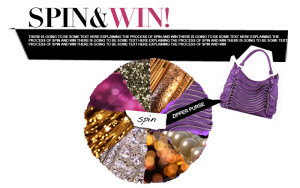 Results: For one digital sweepstakes alone, entitled Spin & Win, we were able to garner 20,ooo spins. 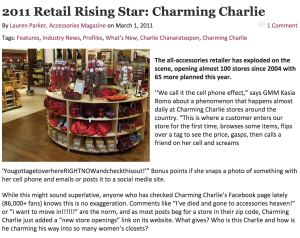 Below is an excerpt from an article about Charming Charlie in Accessories Magazine, written in 2011. “The web is obviously key. 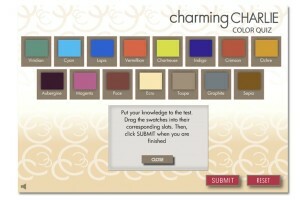 Charming Charlie is eyeing e-commerce, but for now its fun, interactive website and social m edia entities are what drive customers to the site and keep them coming back. (“Sports Mom of the Year”), DIY craft tutorials (“How to Decorate a Frame with Fashion Jewelry”), styling tips (“Accessorizing for a Job Interview: What to Wear and What to Avoid”), care tips (“How to Protect and Care for Faux Pearls”) and fun polls (“What’s Your Favorite Frill Factor?”).